Need some winter sun but bored of the Canaries? 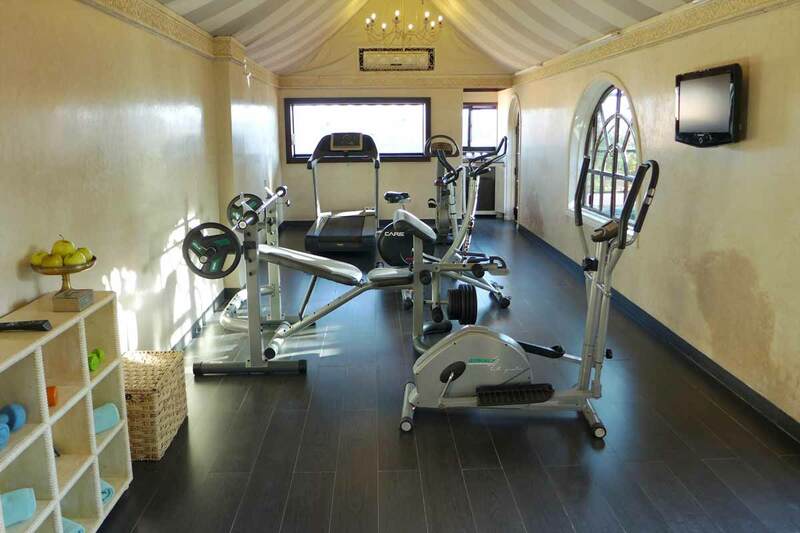 Looking to get away from it all to relax and be pampered? Or perhaps searching for the ideal anniversary or honeymoon destination? 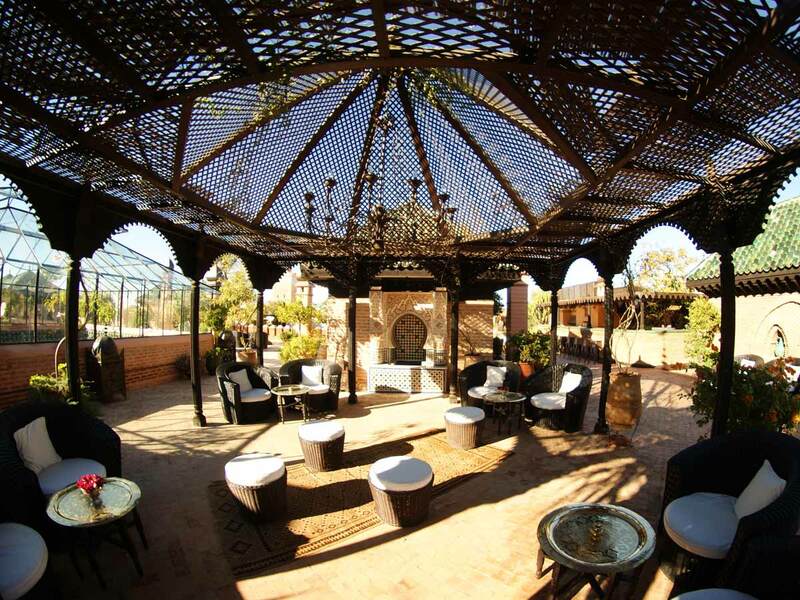 La Sultana, within Marrakech’s walled city, might just tick all 3 boxes! 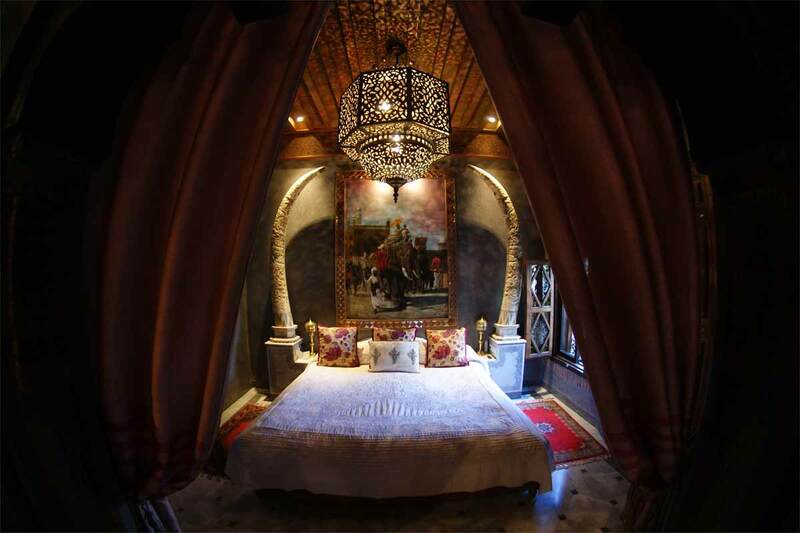 With 5 stars this luxurious property is certainly fit for a king, queen or “Sultana”, which is the female form of “Sultan” and the title given to these rare few female leaders in Muslim history. 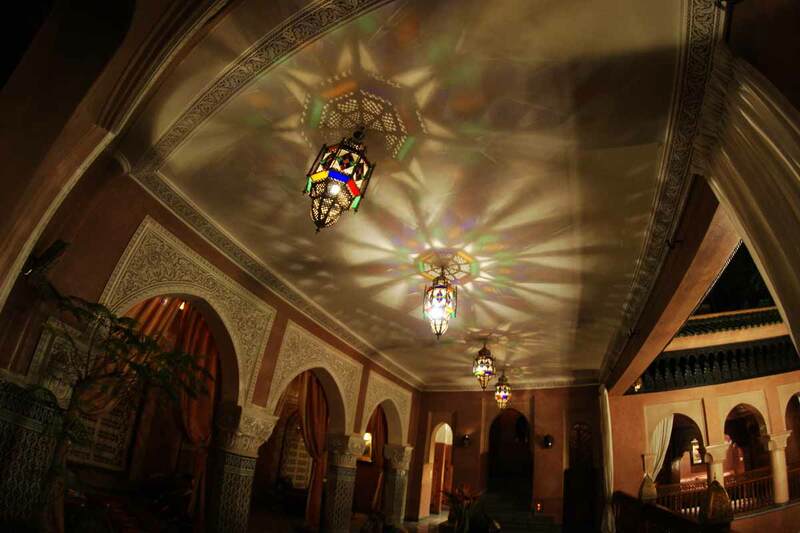 We arrived by plane on Easyjet’s recently launched route between Glasgow and Marrakech and made our way to the hotel. 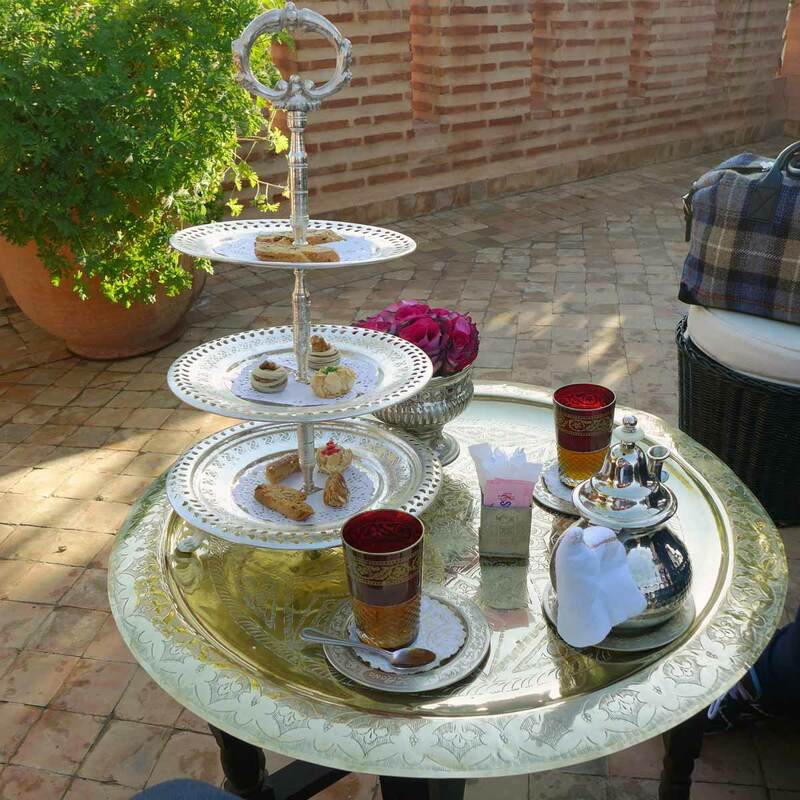 On arrival we were taken upstairs to the roof terrace and treated to complimentary afternoon mint tea with sweet Moroccan pastries. 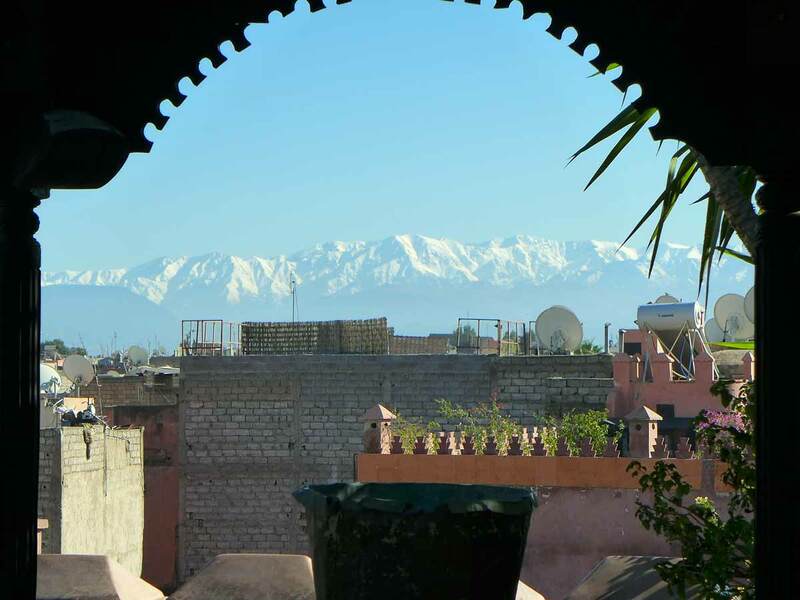 And here’s the amazing view we had from our seats, looking towards the snow-capped Atlas mountains – the hotel will happily book you a day trip here but sadly we didn’t have enough time. 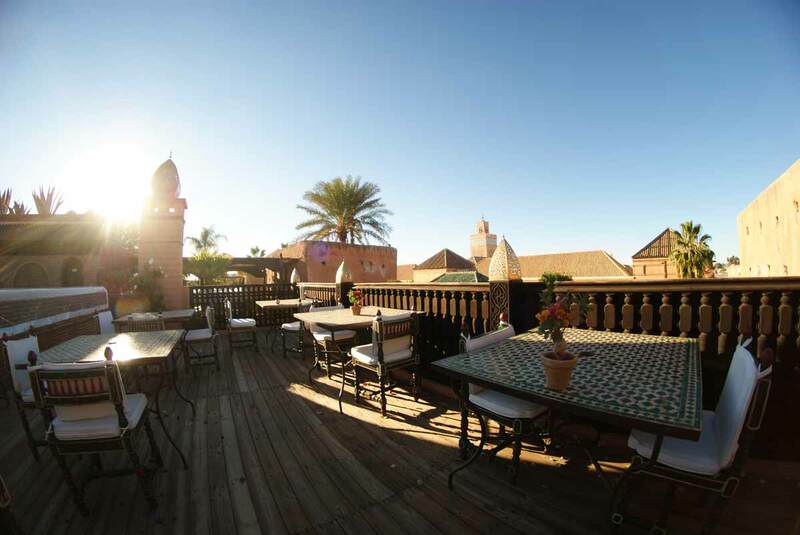 From the other side of the roof you can look into the historic Saadian tombs which are literally right next door. 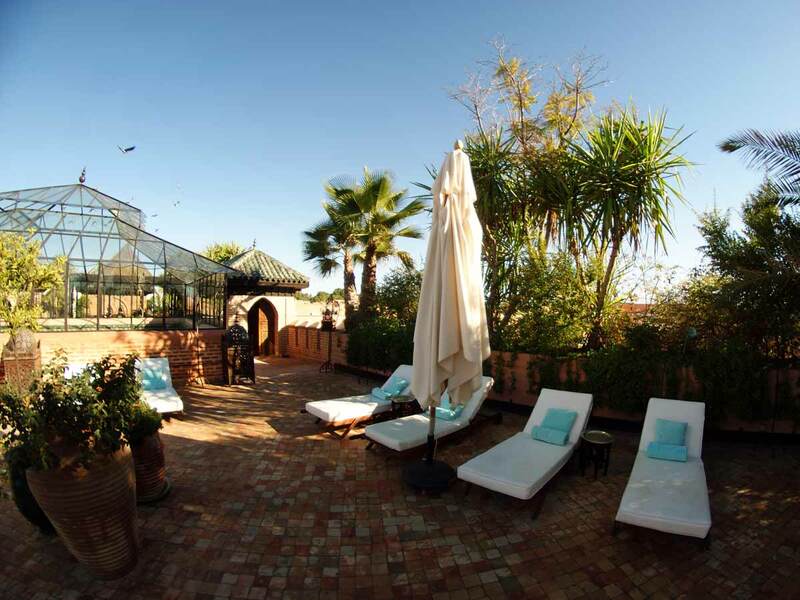 The terrace covers the whole roof so it’s an extensive area with palm trees, sun loungers, parasols, rattan furniture, a bar, a restaurant, cookery class kitchen area and even a gym. If you want some sun there are plenty of loungers and parasols should you need them (a staff member kindly moved ours into position) so we received a much needed vitamin D boost from our time on the roof, and no one is allowed to build higher than the main mosque which is a mile or two away so you have the guarantee that the sun will not be obscured by any nearby buildings! The roof terrace restaurant is only open for lunch in winter (when we visited) with dinner taking place in the same area as breakfast (more on that below) but in summer you can dine in the evening on the roof and watch the sun go down after your meal. You can read about our lunch on the roof here. Before we got to our room a staff member took us on a tour of the hotel and we discovered that La Sultana is a remarkable property, it comprises four riads – a riad being a traditional dwelling with courtyard (usually with a pool) that provides natural air conditioning and protection from the hot African sun. 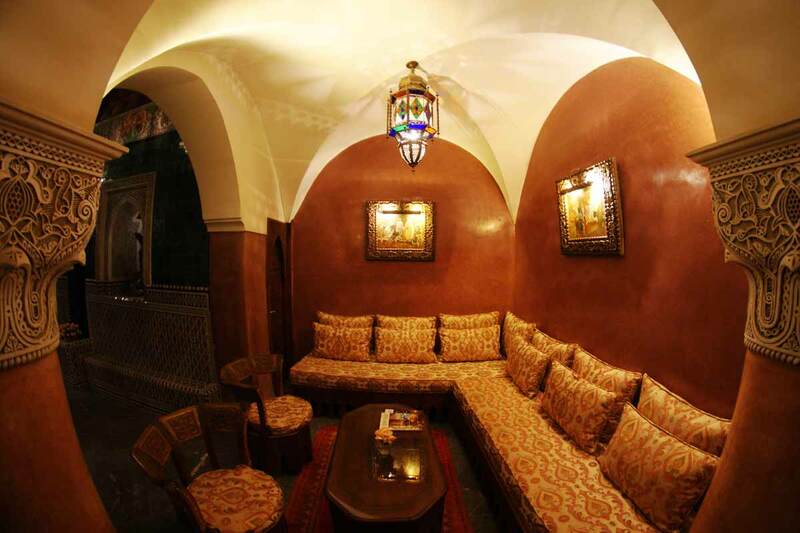 Each of the four riads is styled differently and there are many nooks and crannies where you can chill out. It all looks very regal and as we were there out of season it was quiet and at times so it felt like we had the whole place to ourselves! 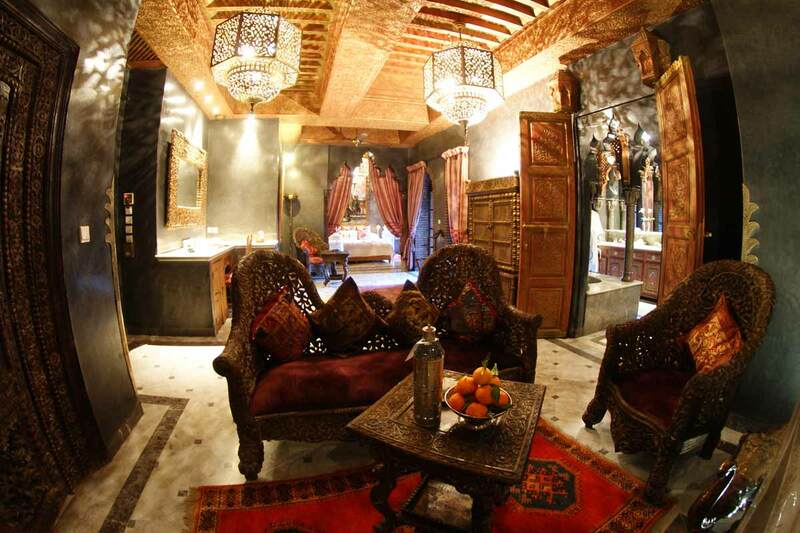 Our room was within the African riad, where there were a number of unique and individual rooms & suites, named after and inspired by animals, such as “Zebra”, “Bison”, “Jaguar” and ours – “Elephant”. 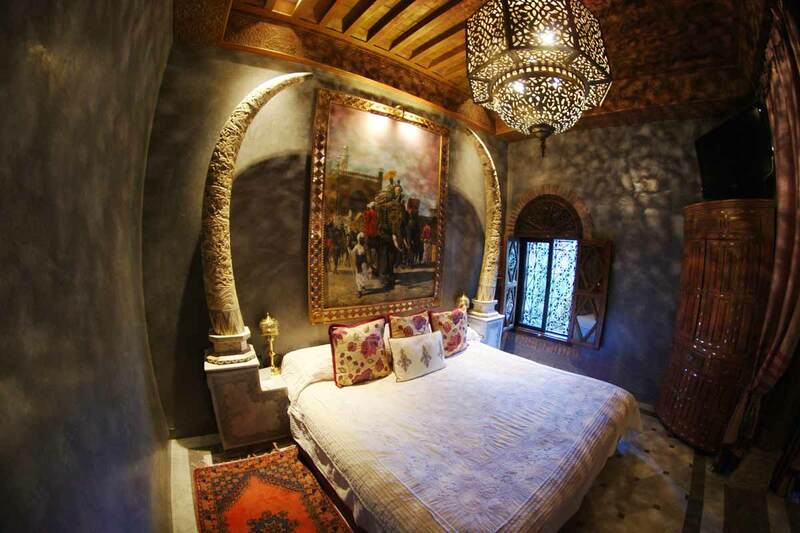 The room was huge and ornately decorated – this was not a room in the usual sense as it wasn’t four plain walls – the detail was incredible with Indian styles mixed with intricate Moorish patterns, carvings and statues of elephants. On the table was a bottle of still water and bowl of fresh oranges. The room also had a soft glow to it – these photos have not been manipulated, this is just how the long-exposure shot came out. Bath robes and a good selection of toiletries are provided in the beautiful bathroom with both jacuzzi bath and multi-function shower (i.e. raindrop and regular), large mirror and double sinks. 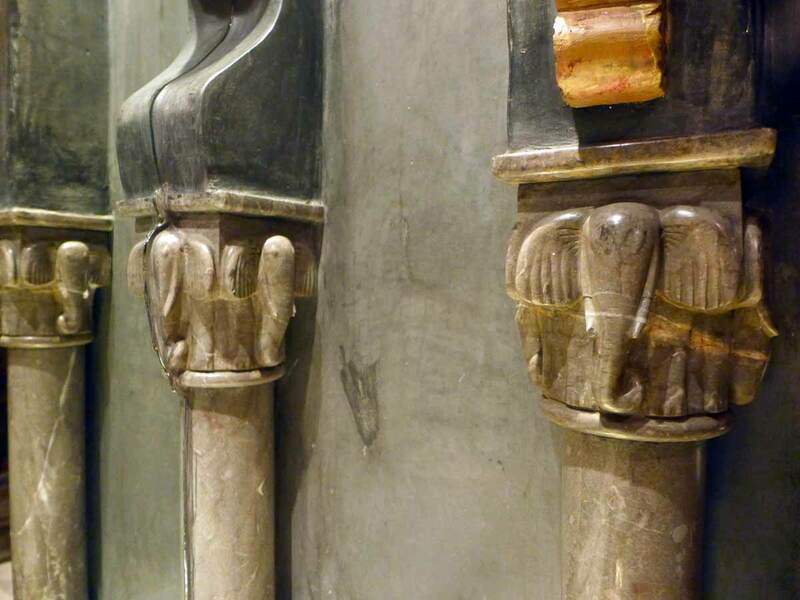 The walls were adorned with these columns to keep the elephant theme going. 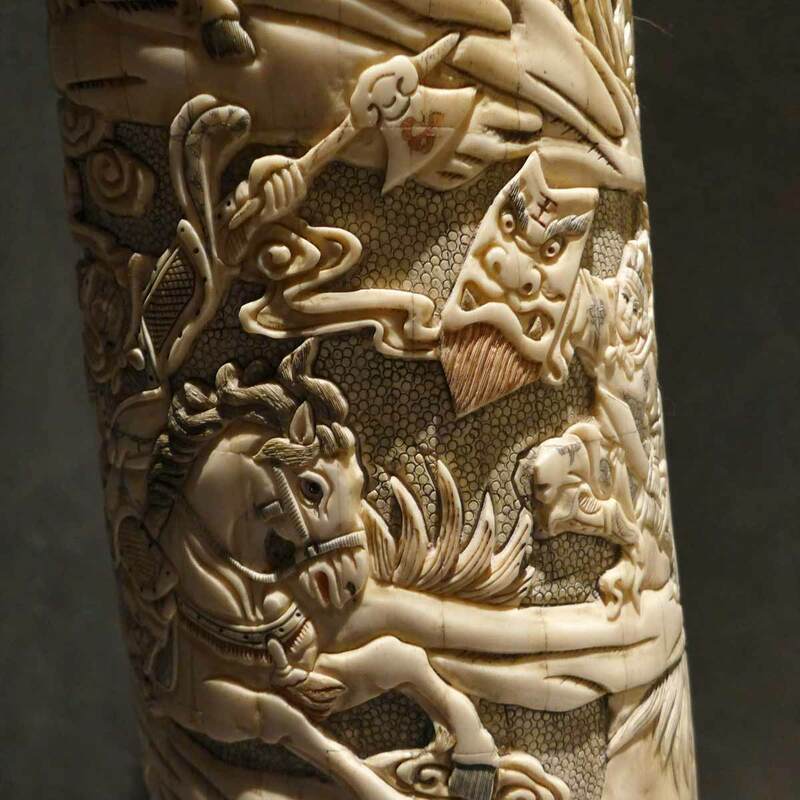 There’s even real ivory beside the bed – two intricately (Japanese-style) carved tusks at either side. There was a cake stand with nuts and pastries waiting for us as well as a small tagine to take back home with us, a mini-bar stocked with various alcoholic drinks (including Moroccan lager) and soft drinks – all soft drinks were free and the alcohol was reasonably priced for a 5 star hotel. 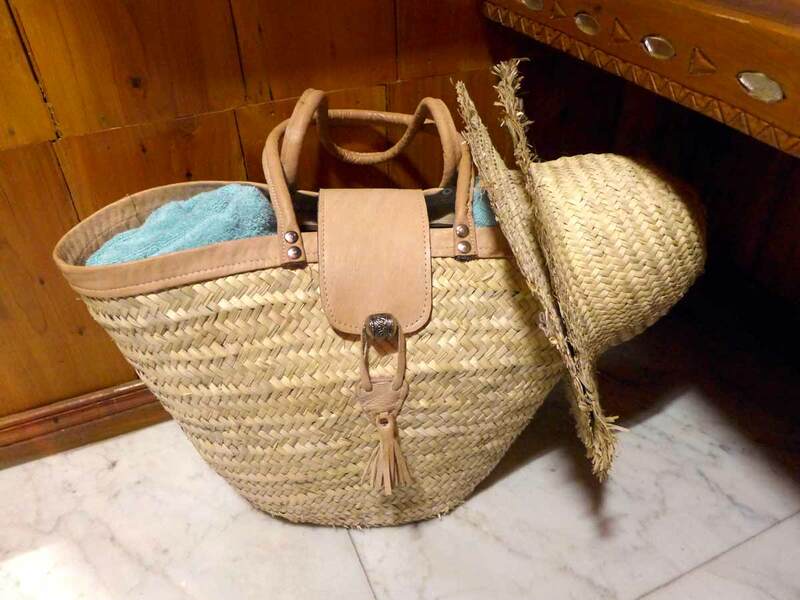 The room even came with a bag packed with towels and sun hats ready to be taken up to the roof terrace for lounging (accessible by both lift and stairs). If that was too far to walk there was also a balcony that looked down to the indoor pool and restaurant. Curtained off from the rest of the room was the impressive comfy bed with huge tusks at either side and equally large elephant painting. This was truly honeymoon material. Our window looked out onto the breakfast/restaurant area and at night during dinner a musician would play an oud, a sort of Arabian lute, while guests ate and the beautiful sounds would drift into our bedroom. For a good example of this type of music check out Tunisian Anouar Brahem who has released a number of albums on the ECM label (I recommend Astrakhan café). In the morning we managed to grab poolside seats for our breakfast (you are free to have a swim here), which also came with an A4 sheet of personalised daily news from the UK. There were cold buffet items and hot items available, and we were introduced to Amlou, a savoury paste made with nuts and argan oil; a bit like a Moroccan version of, and perhaps the inspiration for American peanut butter? You can of course also have breakfast in bed/room service should you feel so inclined. 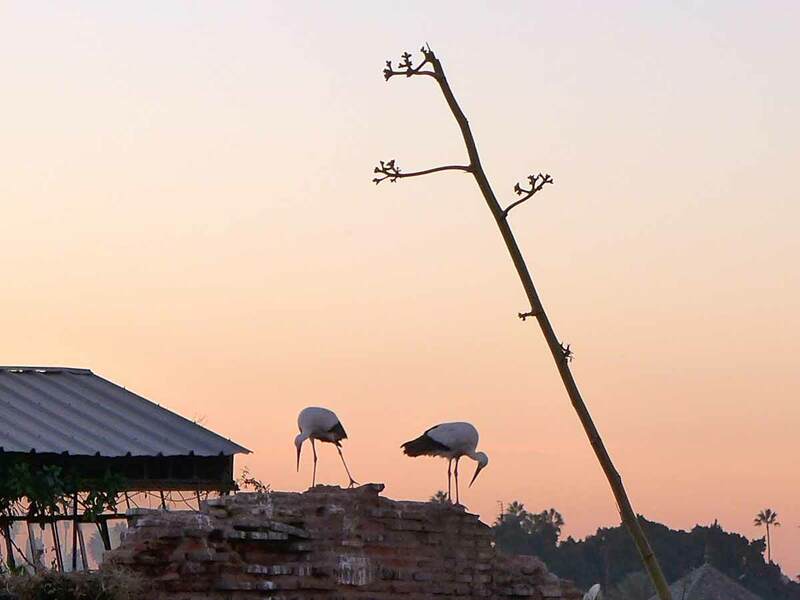 Also of note, are the storks – they are everywhere in Marrakech, and if you are interested you can see nesting pairs from the roof of La Sultana (like these two here), and occasionally they fly gracefully over your head. La Sultana is one of the best hotels we’ve stayed at so it’s well-deserving of its 5 stars, it truly one of the great hotels of the world. The staff were incredible and made sure that we had a fabulous and relaxing stay – Marrakech, especially inside the Medina, can be a chaotic and intimidating place but La sultana provides the perfect respite to it; an oasis of calm, and checking in and out was painless and a transfer to the airport was arranged with other guests who were heading to the airport too. You can read about our spa experience at the hotel here, our lunch here, and our cookery class here which was also our lunch on our second day. 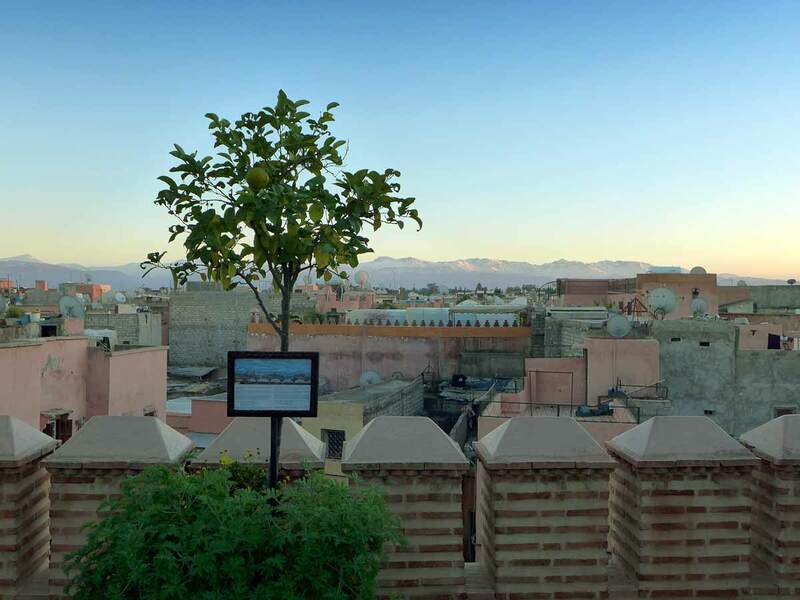 We flew to Marrakech with Easyjet who have recently started a direct route between Glasgow International and Marrakesh Menara Airports. Flights between the 2 cities are every 3 – 4 days and the average price of an adult return is around £100. 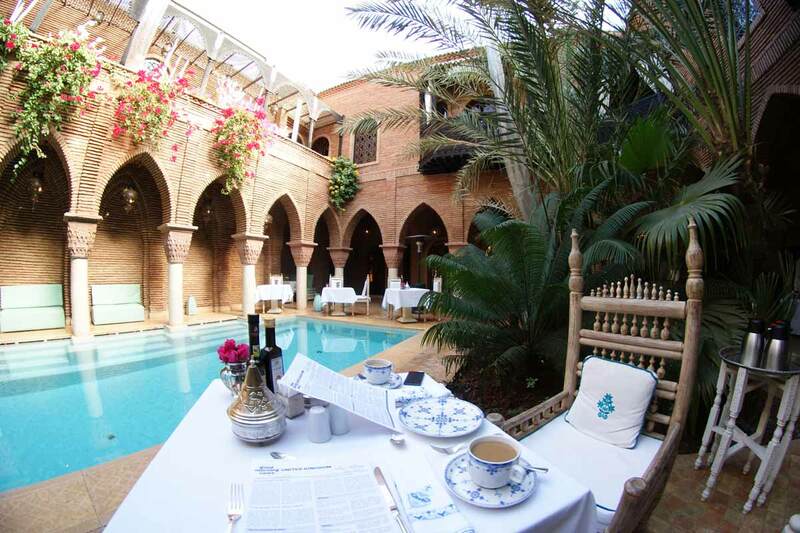 La Sultana Marrakech is a member of Great Hotels of the World Luxury Collection. Double rooms start from £222. 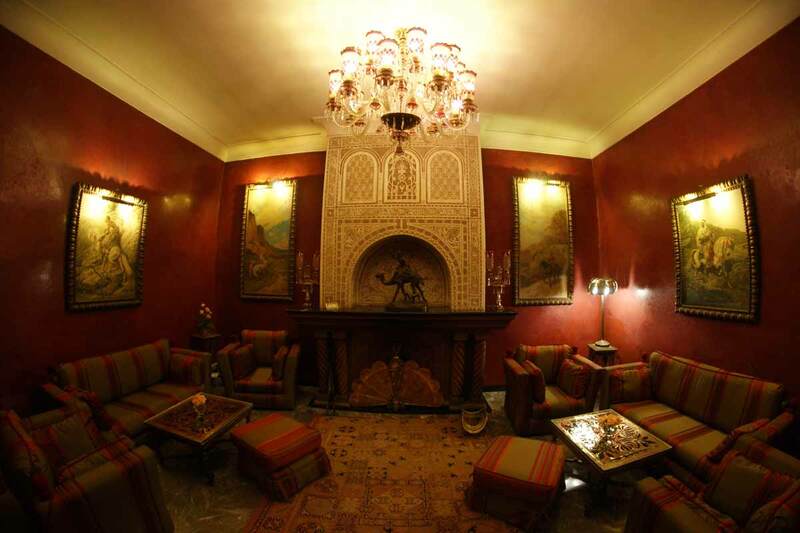 For more information or to book, please visit http://www.ghotw.com/la-sultana or call 020 7380 3658. We stayed as guests of the hotel. Likes to travel, eat weird things and read three books at the same time. Le Week-end at Malmaison – WIN!